Correlations among different traits and genetic interactions among genes that affect a single trait pose a challenge to modern breeding. Traits associated with yield and quality are usually regulated by complicated network composed of multiple loci. As a result, many complex traits exhibit intimate correlation and tend to be tightly integrated, resulting in heritable covariation, which add the complexity for breeding. Therefore, an understanding of how traits co-variation is essential for the genetic improvement of multiple complex traits. Recently, a team led by Dr. TIAN Zhixi, Dr. WANG Guodong, Dr. ZHU Baoge at Institute of Genetics and Developmental Biology, Chinese Academy of Sciences, collaborated with Dr. ZHANG Zhiwu from Washington State University, deeply dissected genetic network underwent 84 agronomic traits, which would provide the theoretical base for molecular design breeding. Soybean is a major crop of agronomic importance as a predominant source of protein and oil. The high efficient molecular design system will significantly facilitate breeding of high yield and quality soybean varieties. To understand the genetic networks underlying phenotypic correlations, 809 soybean accessions were collected from all over the world and phenotyped for two years at three locations for 84 agronomic traits related to growth period, architecture, color, seed development, oil content, or protein content. The researchers identified 245 significant genetic loci through genome-wide association studies and further confirmed 95 genetically interacted with other loci among these identified loci. The team determined that 14 oil synthesis-related genes are responsible for fatty acid accumulation in soybean, which will allow the development of a soybean variety with higher oil content. They also demonstrated that 51 traits could be linked through the linkage disequilibrium of 115 associated loci and these links reflect phenotypic correlations. Meanwhile, they revealed that 23 loci have pleiotropic effects on different traits. 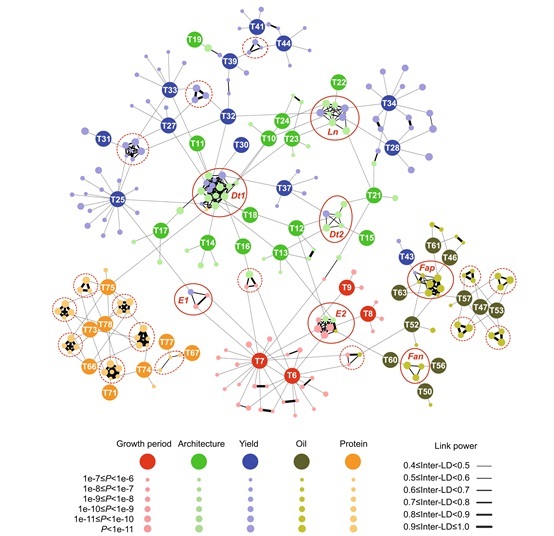 This study established a genetic network of loci associated with phenotypes and provides insights into the genetic correlation among complex traits. These findings will facilitate future soybean functional studies and modern breeding in soybean through molecular design. The work entitled “Genome-wide association studies dissect the genetic networks underlying agronomical traits in soybean” has been published in Genome Research (DOI 10.1186/s13059-017-1289-9) on Aug 25, 2017. This work was supported by the "Strategic Priority Research Program" of the Chinese Academy of Sciences, the National Natural Science Foundation of China, the National Key Research and Development Program, an Emerging Research Issues Internal Competitive Grant from the Agricultural Research Center in the College of Agricultural, Human, and the Natural Resource Sciences at Washington State University, the Washington Grain Commission, and the National Institute of Food and Agriculture, U.S. Department of Agriculture.